Stop what you’re doing RIGHT NOW and meet your new obsession… Andrea Sanger Design! 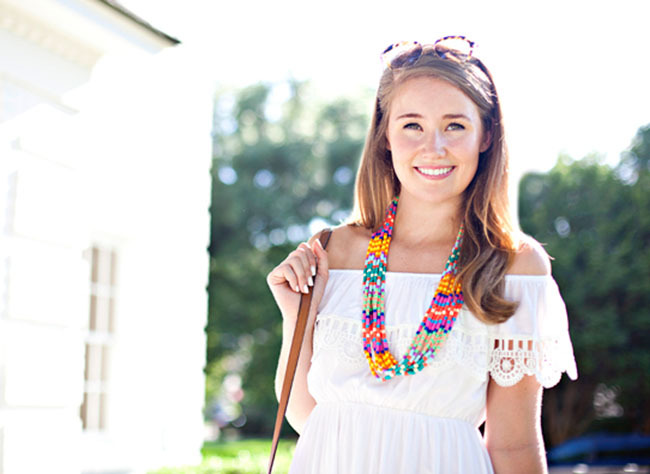 AKA the brilliance behind the gorgeous necklace I’m wearing in today’s post. I was introduced to Andrea (a fellow Austin-ite!) via email a couple months ago, and was instantly floored by her unique, colorful creations. Truly unlike anything I’d seen before. I knew I had to share her work with you all! In visiting her website, you’ll find a whole host of gorgeous designs. As if that wasn’t enough to leave you drooling, though, she also creates custom pieces. I had the best time sharing my love of color with her, which culminated in this necklace, the Happy. Could the name be any more fitting? I can’t help but smile when I see it! 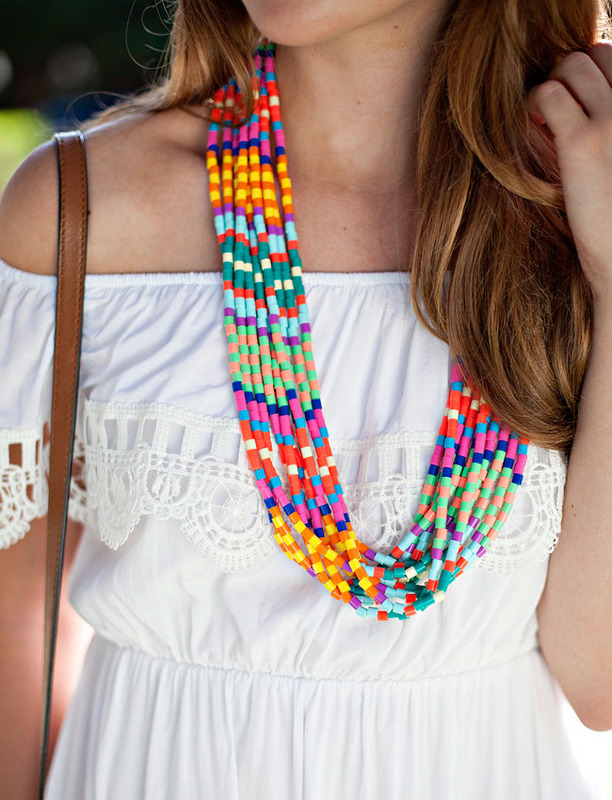 I’m wearing it with a simple white sundress in today’s post so you can see each vibrant color clearly, but what I love most about this necklace is, surprisingly, it’s crazy versatility! I kid you not. The many colors lend to so many different outfits… I have a powder blue maxi I plan on pairing with it to bring out the blue beads, and picture how cute it would be with a pink flouncy top and white jeans. So while it’s a statement piece, it’s one you can wear with a million different looks! I could go on and on (you who have read my long-winded posts know it all too well) but I’ll let the site speak for itself. The Happy is my summer statement piece, and one I am so excited to get so much wear out of. I can’t encourage you sprucing up your wardrobe with an Andrea Sanger piece enough. Have a favorite color that’s always flattering? Or a football team you cheer on every fall? You can’t go wrong with a custom piece, or one of her own designs. What color scheme would you custom create? I’d love to hear in the comments! Ok. Deep breath. Got a little excited. Calming down. I love Andrea Sanger Design. That’s about it. P.S. Don’t you dare forget that the Nordstrom Anniversary Sale starts tomorrow for card holders! If you’ve procrastinated, do yourself a favor and sign up for one now so you can get in on all of the goodness. Be sure to check back here bright and early for a guide to all of the best items! 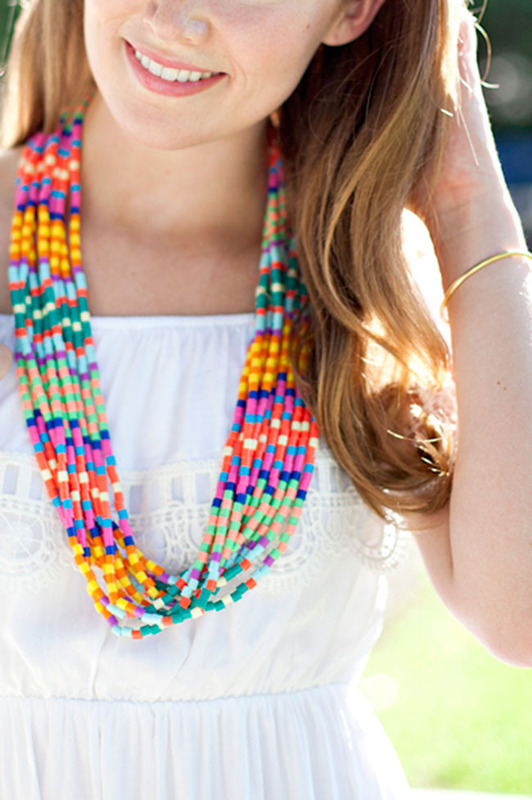 Love the bright necklace! Definitely pops out against the white. Have a great day! I love love love that necklace! The colors are so bright and lively and really make this outfit pop. Love this look! 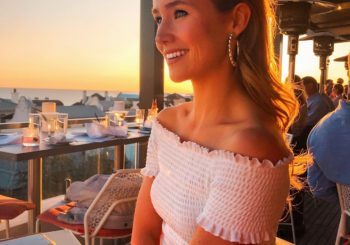 The off the shoulder dress is so darling on you and I feel that this necklace is so “you” because it’s so bright and cheerful! Oh my gosh! That necklace is one of my favorite pieces all summer! So cool and those colors are amazing!! I love this look! The necklace looks so amazing with the white dress (which also shows off your tan!) Gorgeous! That is definitely a great summer necklace. Just think about all the different outfits that it could be paired with. That bright necklace is sublime! What a great find! :) I can’t think of a better color to pair it with, as well, than that gorgeous bright white. Great look! That necklace is too fab with that dress! Love it! That necklace looks absolutely stunning with that dress…! That is something I might never think of pairing together but I love it. So obsessed with this look, so perfect for summer!